The majority of us will reach a point with our homes where we simply don’t have enough room to put everything, and feel like our house is becoming cluttered up with “stuff” – books, shoes, bags and more. Finding that extra space to keep all of your belongings may feel like an impossible task, but there are actually lots of different ways to keep the clutter at bay. The space behind doors is very rarely utilised, but it offers up a world of possibilities. A set of shallow shelves can be mounted behind a door to create extra space in your kitchen – all you need is a rubber bumper to stop the door from hitting them. In the bathroom, your door can be used to attach hanging storage to. These can be filed with toiletries, towels, slippers and more; they are cheap to buy and can make a huge difference to the space available. Although one bookshelf or storage unit can look a bit out of place if you just bring it into a room on its own, by placing multiple shelving units flush against the walls you can create the look of built in storage. Most shelving units are pretty easy to put together, and you can even make your own if you’re feeling crafty. If you keep the shelves quite shallow, then they shouldn’t take away too much space in the room, but will help you keep it tidy. 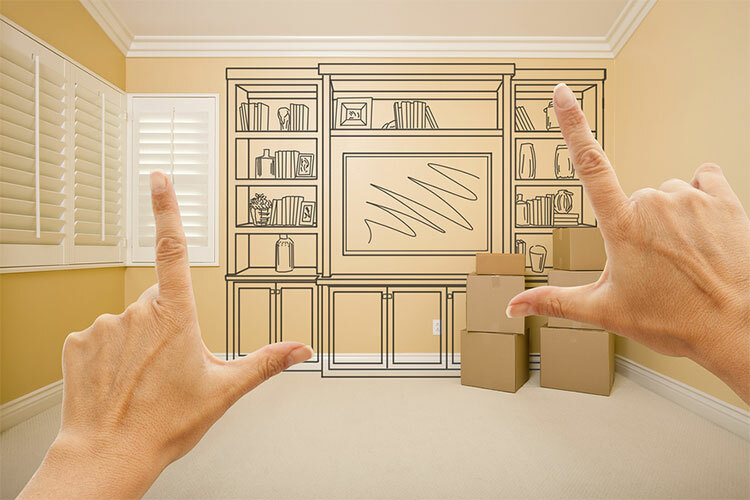 If you live in a very small house, then you may not have the space to add any extra storage units. One of the best ways to create extra room is by recessing shelves into the walls of your house. Find a space with no obstructions and locate the studs in the wall. When you have found a good space you can install the shelves or ask a handyman to help you do it – it can be fiddly, so it’s always good to get an expert on board. Of course you will have lots of storage space in your closet, and this can be enhanced with multiple in-cupboard storage solutions, but often people forget about the extra space a cupboard may have around it. Often cupboards and cabinets are situated in a room so that there is still a space between the side of the cupboard and the wall. This means you can utilise that gap with some extra shelves. You can also usually use the space above a cupboard for extra storage. Lots of homes already make the most of the space under the stairs with a small cloakroom or downstairs loo, but many properties still have quite a large space available to be used. If you have a space then think about how you can turn it into shelving or create a nice cupboard to store extra bits and bobs. If your staircase is near your front door, then you could use the space to hang coats and shoes in.